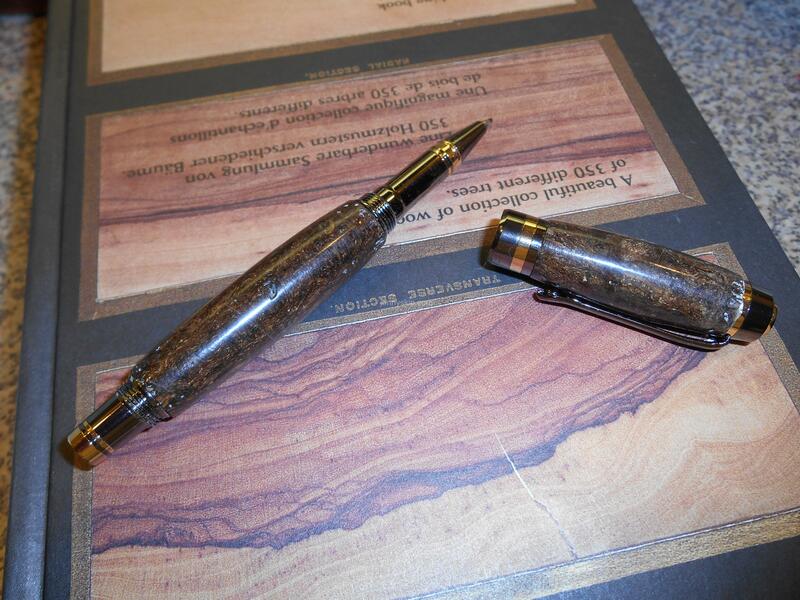 Earlier in the year, one of my students was nice enough to give me a cigar to turn into a pen for my niece’s husband. I told my student that if he could get me another cigar, I would make him a pen, for his generosity in helping me with the earlier pen. This was special for this student, since a friend of his has started rolling cigars. 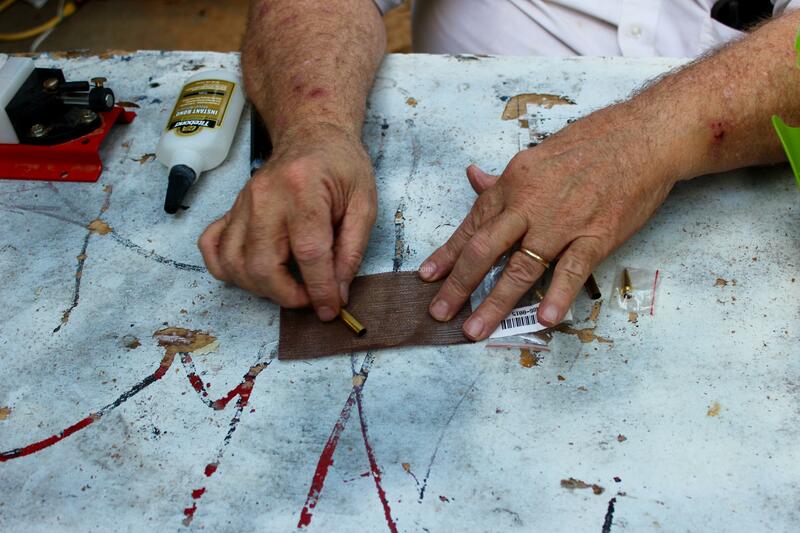 (Take a look at our earlier blog for some historical notes on cigar production on Florida.) His friend’s cigar company is Bat Brothers Cigars. I was told how it got its name but I think I’m suppose to keep it a secret. The cigar he gave me was a nice fat cigar and looked like it would make a great pen blank. I decided to use the PSI Classic Elite 2 pen kit with the roller ball option. This pen kit has two barrels and looked like it would be perfect for the length of the cigar I had to work with. 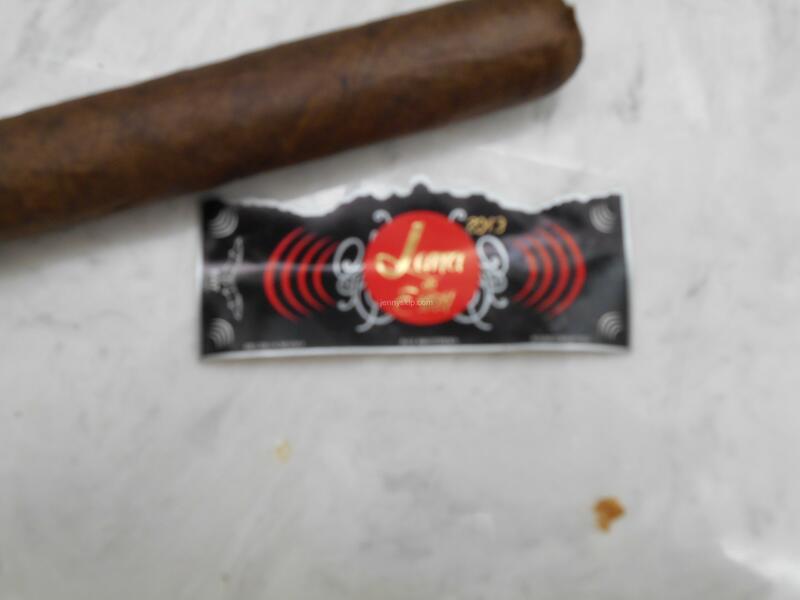 So I removed the cigar’s paper ring and set off to stabilize the cigar. 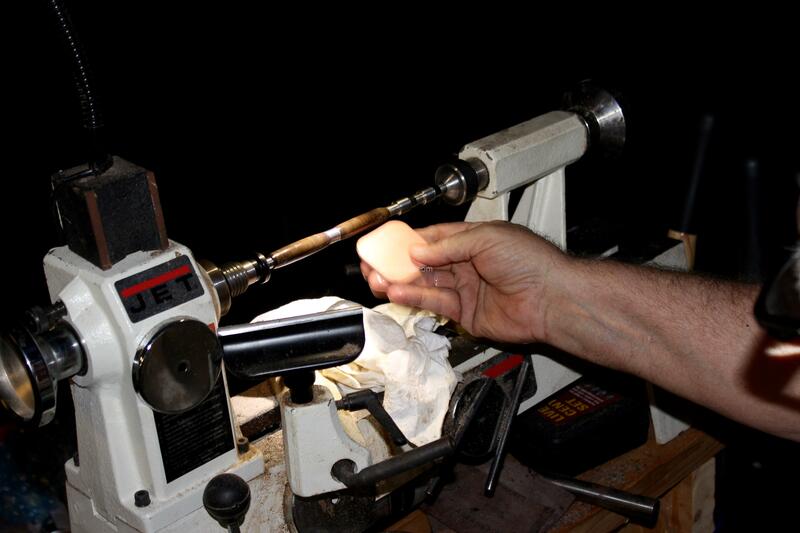 Before putting the cigar in the vacuum chamber, I snipped off the mouth end of the cigar so the resin would be able to easily enter the cigar from both ends. I then placed the cigar in the vacuum chamber, placed the retainer on top of the cigar to hold it in place and covered the cigar with Cactus Juice, allowing about an inch more of liquid above the cigar. 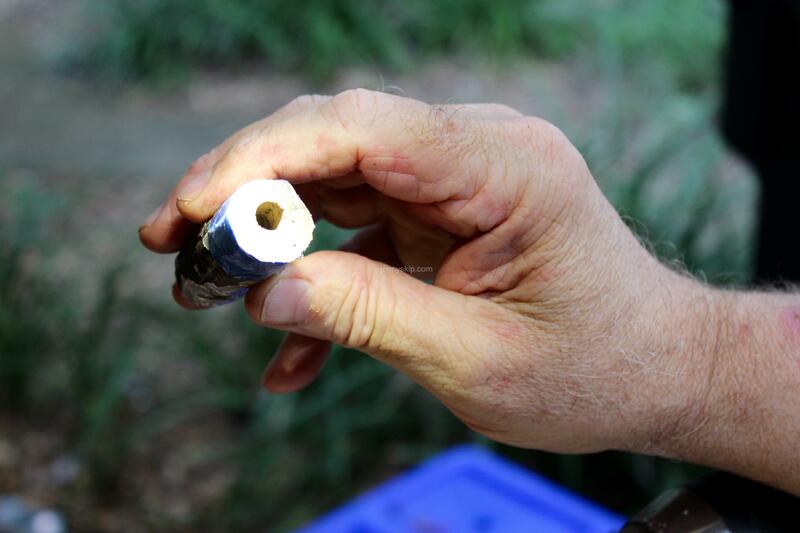 I then turned on the vacuum pump and began to close down the vent valve to place a vacuum in the chamber. Then I waited for the bubbles to stop coming out of the cigar, an indication that all the voids in the cigar would be full of resin. And I waited, and waited! I was surprised to note that this cigar took an exceptionally long time to fill with resin. The previous cigar had not taken anywhere near as long. I think this was a good sign that this cigar had more voids, and might end up more stable than the last cigar I did. After the bubbling stopped, I released the vacuum, letting the chamber return to atmospheric pressure, and removed the cigar quickly and wrapped it tightly in aluminum foil. While all this was going on, I had preheated the oven to 200 degrees F. I built a small aluminum foil dish and placed the wrapped cigar in the dish to protect the oven if any of the resin leaked from the wrapper on the cigar. I waited about three hours and removed the cigar from the oven and let it cool to room temperature. When I finally unwrapped the cigar, I found it was rock hard. I didn’t remember the other stabilized cigar being this hard. I concluded that this was consistent with the longer time it took to completely fill the voids with the Cactus Juice. This cigar was more completely filled with resin. I went to the disk sander and sanded each end of the blank. 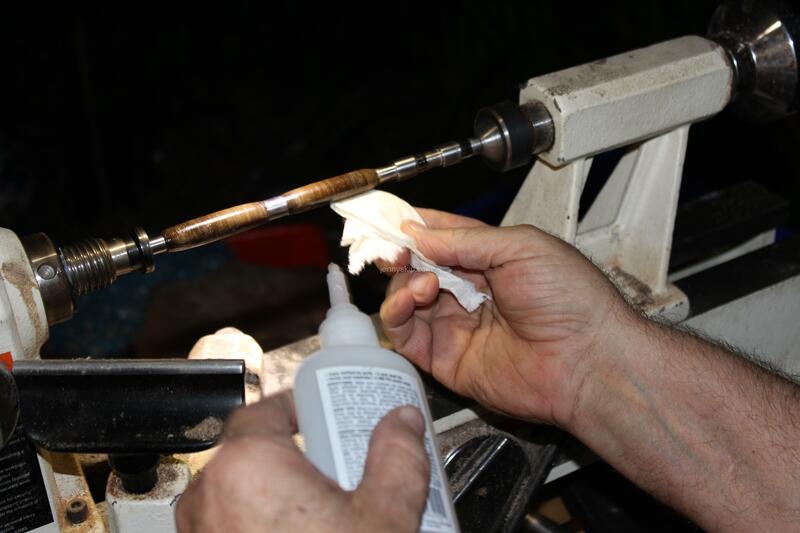 I observed that each end of the cigar blank was filled with resin, resulting in a smooth surface after sanding. Of course during the sanding process I got to experience the smell of fresh cigar smoke! This was in spite of having on a dust mask. I took the brass tubes from the pen kit, measured off the length of each end of the blank and used a band saw to cut the two barrels for the pen. There was just a small scrap of the cigar left. 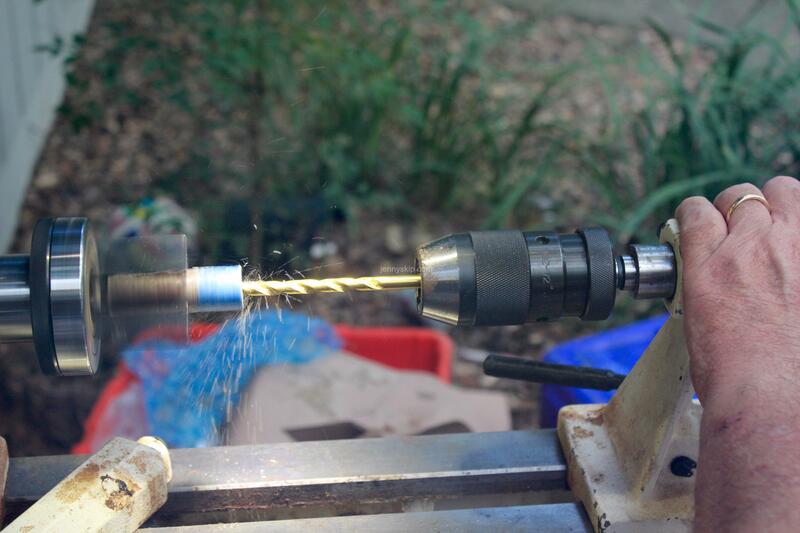 Then I set up my lathe with a pen chuck and a Jacob’s chuck to drill the 10mm hole through each blank. This created a lot of cigar dust which proved useful later on in the process. I roughed up each brass tube to give their surfaces a little tooth for the glue-up into the blanks. I used 80 grit sandpaper for this. Using thick CA glue, I glued each tube into its appropriate cigar blank. (I would find out later that I could have done a better job of gluing. ) 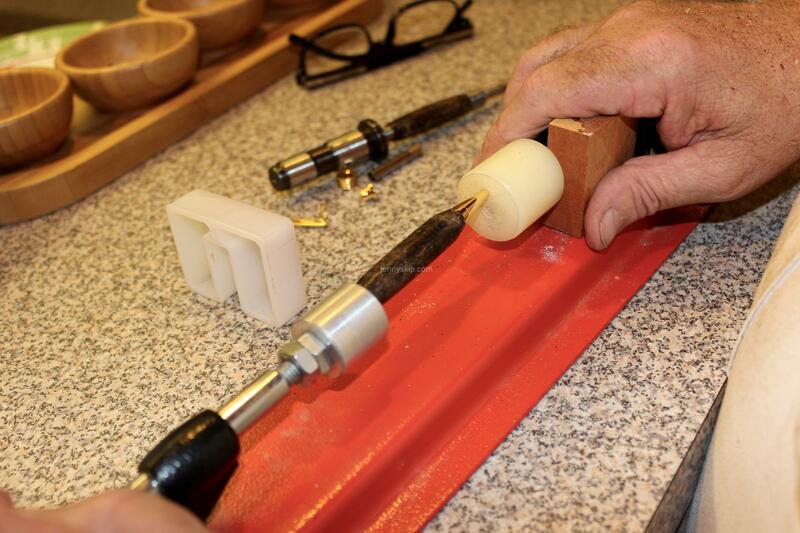 Once the glue had set, I went to the disk sander to trim up the ends of the blanks down to the brass tubes. Lots more cigar smell and cigar dust! I then inspected the ends of the blanks. The ends looked pretty solid, but as a precaution, I put some thin CA glue on the ends, hoping it would wick down into the large pores that I could see. 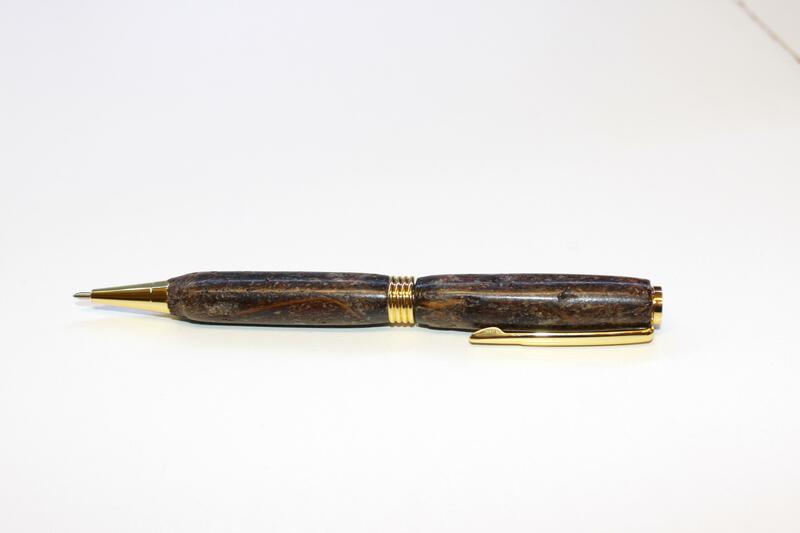 Using the proper bushings for this pen kit, I mounted the pen blanks on the pen mandrel and prepared to turn the project. The cigar blanks were still coated with some resin so I decided to use 80 grit sandpaper to remove this, before I started using any turning tools. To remove the majority of the blank, I desired to use a round carbide tool. I turned the blanks with very light cuts, stopping often to check the work. My previous experience with a serious blowout prompted me to work slowly and carefully as I turned the cigar. I was making great progress when my worst fears came to fruition: the smaller blank exploded in pieces! I found all the pieces and began gluing the blank back together. There were a few voids left, which I filled with a mixture of CA glue and some of that cigar dust I had collected. 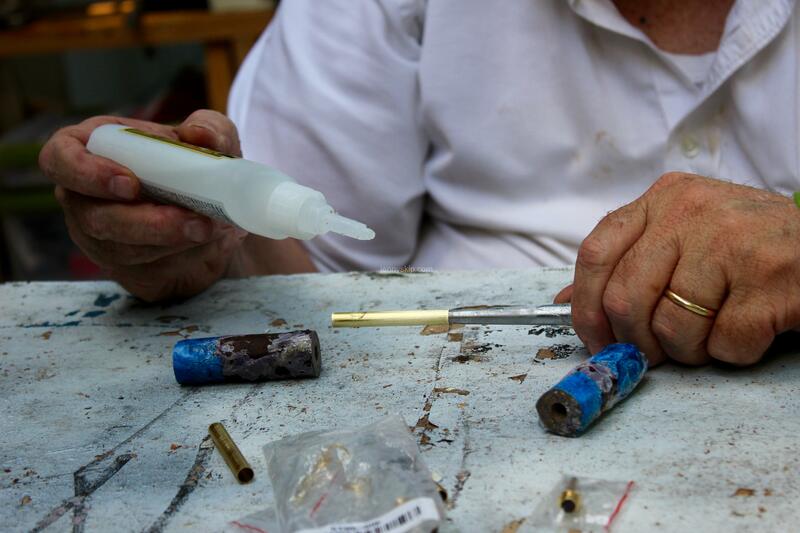 Looking at the way the blank came apart, it appeared that the failure was due to insufficient glue contact between the brass tube and the cigar. 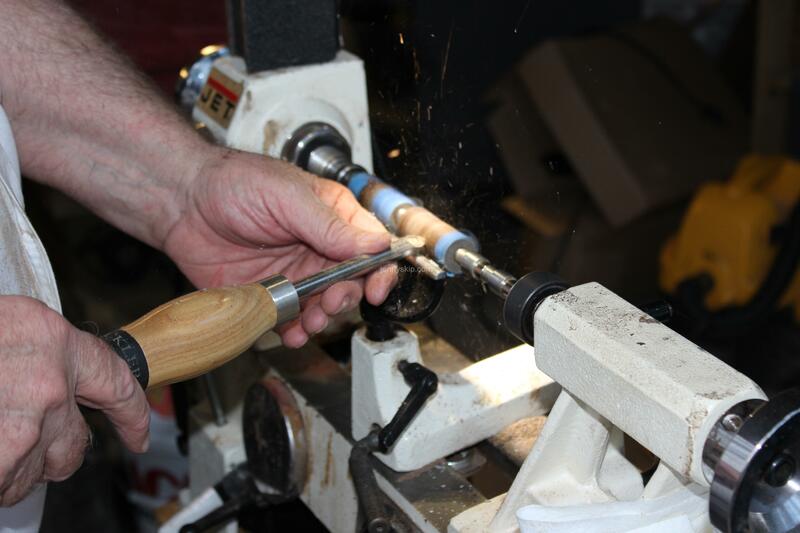 Back to the lathe! 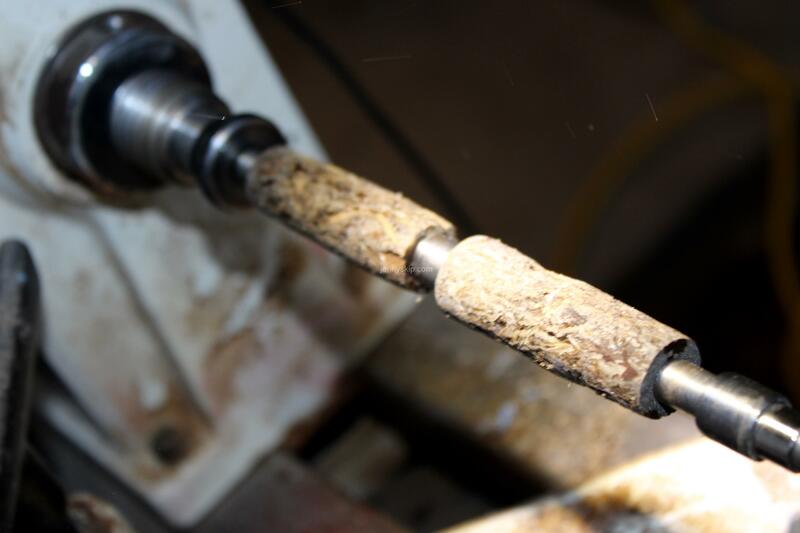 Since I was very close to the diameters of the pen bushings, I decided to finish up the turning with 80 grit sandpaper. 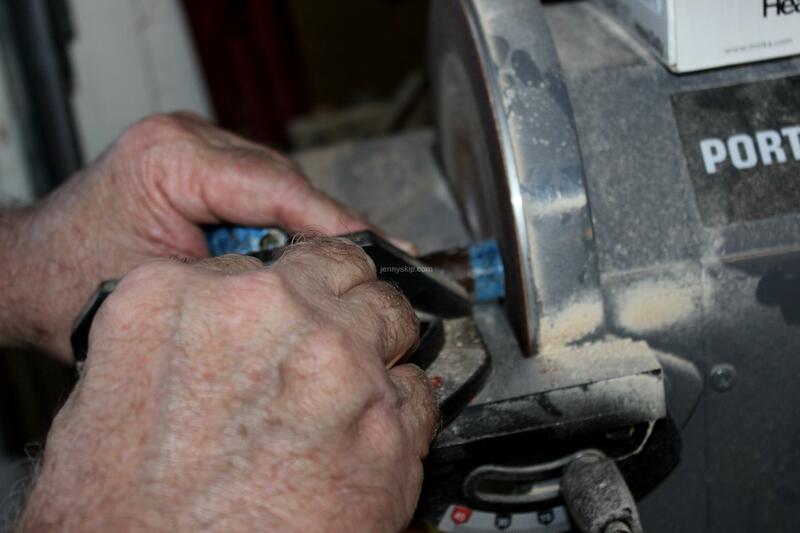 This worked very well and allowed me to quickly complete the rough “turning” and move onto final sanding. 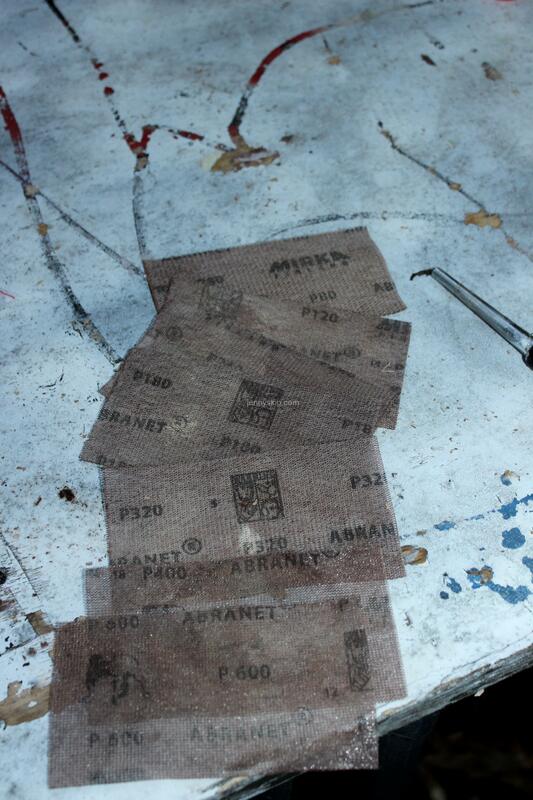 After sanding to 500 grit dry sandpaper, I cleaned the surface of the blanks and began the application of thin CA glue. After a few coats, I checked the surface of the blanks and used thick CA glue to fill any imperfections. I wasn’t looking for perfection since this was a cigar. After 10 coats of CA glue, I went to the wet sanding with micro-mesh to 12000 grit, cleaning the surface between grits. I followed this up with the One Coat plastic polish. Finally I could remove the blanks and assemble the pen. All in all, I was happy with the final pen and hope my student will be happy with it also. I guess the next pen will be a revisit to the ant pen in response to one of our Australian viewers.